In continuing with FMP’s March theme of analyzing what makes teams successful, we’re examining the more popular personality-based assessments project managers can use to ensure they’re building a team that is dynamic, results-oriented, and, of course, successful! FMP has experience utilizing the following personality-based assessments to recognize employee behaviors and patterns when assembling project teams. We have also provided trainings and coaching on how mangers can best interpret the results gained from the personality tests to customize interactions with clients or fellow colleagues. 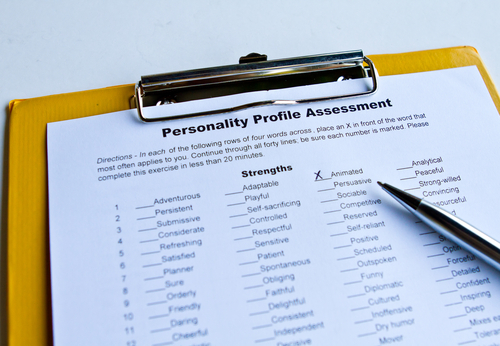 Pros- Among one of the newer personality assessments in the field is Strengths Finder. This is based upon the self-help book by Tom Rath and is widely used when first welcoming a new team member onto a project. For example, we’ve seen project managers use this assessment when determining where a new team member might fit best when assigning project tasks early on. The assessment matches the employee’s strengths to tasks, working under the assumption that identifying the team member’s strengths early in their onboarding process and matching the employee to tasks that fit his or her particular strengths will then lead to individual and team success, through increased employee and client satisfaction. Cons- Strengths Finder has its drawbacks; however, specifically the lack of ability to manage an employee’s motivations and aspirations. A project manager having insight and an understanding of what motivates their team members is a powerful tool. For example, having this kind of information allows leaders to effectively communicate big picture goals in order to incentivize employee behavior, if that is meaningful to their employees. Strength Finder does have a difficulty articulating those specific motivations. Pros- Another behavior assessment tool FMP has used with clients both in the private and public sectors is DISC, which allows individuals to examine their behaviors in four areas: Dominance, Influence, Steadiness, and Conscientiousness. Overall, DISC is a personality assessment that is non-judgmental, meaning it has no good/bad categories, or scoring system based on given answers. Most recently, FMP conducted DISC training for a technology consultancy, where FMP demonstrated the use of recognizing and understanding other employee’s DISC styles in the workplace. The training enables participants to become more aware of other colleagues’ DISC styles and modify their own interactions based upon that person’s perceived work preference. Cons – Although a great assessment to leverage, implementing this one can be costly and would need to be weighed as an organizational investment. Pros- One of the assessments our coaches and consultants are skilled at interpreting is the Thomas-Killman Instrument (TKI). This assessment is designed to assess an individual’s behavior in conflict situations. According to the TKI Scale, a person’s behavior can be described in two dimensions during conflict: Assertive or Cooperative. Then there are 5 “modes” or behaviors that support those dimensions: Competing, Collaborating, Compromising, Avoiding, and Accommodating. An individual’s TKI score indicates the preferred mode he or she uses in conflict situations; therefore, one of the major advantages of TKI is the ability to understand how you and your team members may react when project problems may arise. FMP believes the best way to solve any conflict is by doing so in a transparent and constructive manner and, by doing so, a key determinant in team productivity. Cons- A criticism of TKI is that it does not address the fact that creating conflict and competing on idea generation is awarded within some corporate settings. For example, the corporate culture within Amazon is to constantly innovate and challenge ideas of others. According a 2015 New York Times article, the competitive cultures at Amazon encourages team members to tear apart one another’s ideas and create a conflict, all in hopes of pushing people above and beyond their creative limits (Jodi Kantor, 2015). The goal of these exercises is ultimately in support of incentivizing the next great idea. In this sort of corporate culture, TKI might not be the best assessment to utilize. Building strong teams is a complex process and assessments can help provide insight into individual strengths and preferences, as well as enable team members to better anticipate and understand how and why their teammates may respond to a given situation. This awareness, regardless of the assessment used, can create more shared understanding and trust within the team, resulting in greater team performance. As this blog shows, each assessment has different strengths and weaknesses- finding the right one for your team will be based on the specific outcomes and needs of your team in that moment. Feel free to reach out to us if you’d like any help selecting the right assessment to jump-start your team’s performance!